Ashland began in 1952 as Ashland Plastics. Since 2007 Ashland Trap Distribution has been manufacturing and distributing grease traps and grease interceptors for foodservice establishments and healthcare facilities. The PolyTraps are the next generation of grease trap technology, designed to never rust or corrode. All PolyTrap models meet PDI standards. 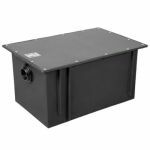 Ashland’s APGI grease interceptors also meed PDI standards and are available in a variety of configurations.